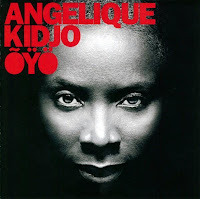 Oyo is not just a great album of truly global music, it's a glimpse into the musical mind of a modern music icon. One of the most successful contemporary African artists, Kidjo has assembled for her new album a fascinating array of cover songs, many of which marked key points on her musical journey. "This is the story of my childhood," she says. "All these songs brought me to where I am today, inspired me to do the music I have been doing for many, many years. This music has always been my Bible, the thing that reminds me what is the mission of the arts." Kidjo's musical cannon includes the first song she sang in public, “Atcha Houn,” a traditional melody she describes as “a kind of parade music people sing when they gather together. I sang it at my Mom’s theatre company,” she recalls. “My Mom had to push me on stage to do it, but that’s when my addiction to singing, and to the stage, too, got started.” Also in the mix are jazz, blues, R&B, even Bollywood on "Dil Main Chuppa Ke Pyar Ka." And undoubtedly one of the most spun tracks on the album will be her cover of James Brown's "Cold Sweat" with backing by members of Antibalas, despite its surprisingly low energy. James Brown was a star and huge musical influence all over Africa. And in Kidjo's world, a couple other US pop stars also shone brightly, influencing her future direction. Her cover of "Samba Pa Ti" with trumpeter Roy Hargrove pays tribute to the influence of Carlos Santana, just as she gave a nod to Jimi Hendrix with "Voodoo Child (Slight Return)" on her 1998 album Oremi. One of the most compelling songs on the album is Aretha Franklin's "Baby I Love You," with guest vocalist Dianne Reeves. With other flavors including a tribute to Miriam Makeba ("Lakutshn Llanga") and an energetic reworking of the South African workhorse "Mbube," Oyo has something for everyone, even if it's not Kidjo at her edgy and original best.